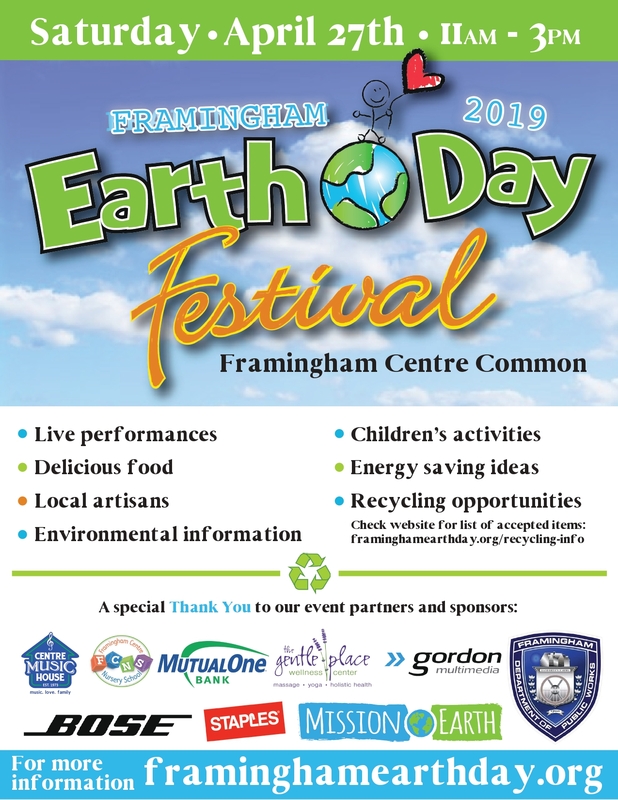 Come to the 9th Annual Framingham Earth Day Festival on Saturday, April 27th from 11am to 3pm at the Framingham Centre Common. Explore over 100 environmentally friendly vendors with friends and family. Enjoy live local music, diverse lunch options, kids activities and free fitness classes. We hope you can join us for this beautiful event. If you want to volunteer the day of the event send us an email: FraminghamEarthDay@gmail.com For full info see: http://www.framinghamearthday.org/ Your Impact Matters! 1. Bike, walk, or carpool to the Festival. 2. Bring your own water bottle to fill up at our free water stations. 3. Bring your own reusable shopping bag to carry any treasures you find.